With only a few days to go until the assembly of bishops from the Middle East, the region is dominated by tensions between Sunnis and Shiites; stalemate between Israelis and Palestinians, persecution especially in Egypt. The Synod will also be able to make proposals for politics. But most of all it must reawaken the duty and mission of Christians in the Middle East: the freedom and right to offer witness to God's love in front of Jews and Muslims. Beirut (AsiaNews) – With only a few days to go to the opening of the Synod of Bishops for the Middle East (October 10 to 24), the Vatican Press Office has published the list of invitees. Among them, invited as an expert, Fr. Samir Khalil Samir, a great friend and collaborator of AsiaNews. We asked him about the expectations aroused by the Synod. Just as the Synod is about to begin, there is a growing tension in the region, both in Iran and in the relationship between Israelis and Palestinians. Will all this affect the Synod? The preparatory documents very explicitly state that the political situation and the Israeli-Palestinian conflict affects the lives of Christians with regards their economic prospects, emigration and their freedom. On closer inspection it is obvious that underlying the current tension in the Middle East is a troubling inter-Islamic conflict, namely the relationship between Sunnis and Shiites. The whole crux of the problem is concentrated on the UN’s international tribunal which is expected to publish the results of its investigation into the assassination of the late Lebanese Prime Minister Rafik Hariri by the end of December. Apparently, Hezbollah appears to have had an active role in the assassination. And since Hezbollah is armed, even by the Lebanese army, it is threatening conflict. On the other hand, throughout the Arab Muslim world, no one wants to start a war, or a serious confrontation with Iran. Behind Hezbollah is, in fact, Iran. The problem therefore does not relate primarily to Christians, but Muslims against Muslims. And this gives Christians and Lebanon as a whole a breathing space. Meanwhile, Syria is, as has become its tradition, batting for both teams: it is distancing itself from Hezbollah, making increasing overtures to the Saudi king, but then, as has been the case in recent days, putting Lebanese who do not belong to Hezbollah on trial for the assassination of Hariri. For this very reason I hope that the situation will prove to be one of empty threats aimed at emerging strongest in the relationship between Sunnis and Shiites. Everyone is afraid, but nobody wants a war, moreover, it would be an internal affair of Islam, which would divide and weaken all involved. There is also a lot of ambiguity surrounding the Israeli-Palestinian issue. Israel on the one hand, will not accept a moratorium on settlements, and on the other, even among Israeli hawks, there are some who admit the possibility of a Palestinian state. This is the most reasonable proposal. Of course there are still some pressing issues to be resolved: Jerusalem, water, the return of Palestinian refugees, Israeli settlers in the West Bank. If we really want peace, then we should at least put some principles on paper and then put them into practice: two states with clear borders. Unfortunately, Israel has never accepted the border issue, while on the Palestinian side there are still those who reject the very existence of Israel. The decision for two states is the most reasonable, while leaving some issues still under discussion: Jerusalem, some boundaries. Lately there have even been some who speak of a one state solution bringing together Israelis and Palestinians, but for now I think it is difficult, if not utopian. How far the two leaderships are prepared to walk along this path, I do not know. Are the two peoples able to overcome their religious and historical passion in favour of a political realism that takes all aspects into account? I do not know, only history will tell. The Synod, however, from this point of view, can only offer the most realistic solution: the reasonable, taking into account the circumstances of the Israelis and the Palestinians. Currently it seems that the Arab countries are the most willing to take this step, the Palestinians will have to follow them because without the Arab countries, Palestine can not exist. But if Israel does not decide to stop the settlements, everything will go down the drain! I hope that on both the Palestinian side and Israeli side there are politicians with enough good sense, aided by the international community, to take action. Above all the Synod must serve to enhance awareness of the mission of Christians in the Middle East. Until now, many bishops have spoken about the situation of Christians from emigration and the emptying of the churches, to the violence, as inevitable. 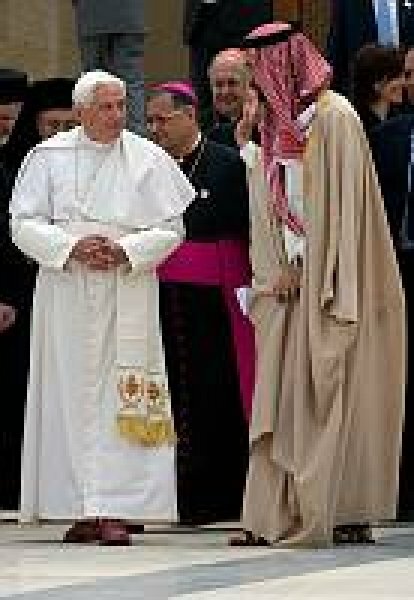 But Benedict XVI, during his trip to the Holy Land in May 2009, started to say that the task of Christians is to "stay" in the Middle East because they have a mission to carry out. Certainly the problems between Christians and Muslims in this region are many and widespread. This is evident in Egypt. Here there is tension and conflict between Copts and Muslims everyday. In recent times there has been a sustained media attack against Anba Bishoi, the patriarchal vicar. The bishop apparently said that in the early Koran, the Gospel and Islamic faith had a lot in common, that the diverging aspects were later additions to this original version of the Koran. I do not know if the bishop really said these things, which in any case, pertain to the realms of scholasticism. But the accusation has become a pretext for street demonstrations. When basically what he says (or apparently said) shows the bishop’s desire for dialogue and sharing with Islam. This illustrates an extremely tense situation between Christians and Muslims. But it is not the case in Lebanon, Syria, and Palestine. In Iraq it depends on the moment and often the persecution of Christians is a result of power struggle between Sunnis and Shiites. However does the plight of Christians depend on politics and on this alone? Of course politics is what decides the orientation of any nation and is crucial for a small minority, as is the Christian minority. We note, however, that the Christian minorities in the Middle East can not be compared to Muslim minorities in Europe. These have been in Europe for several generations: Christians were in the Middle East before Islam, they are the region’s indigenous peoples. The Pope’s discourses in the Holy Land and the preparatory document for the Synod seem to say to Christians: "stay until the very end." And above all, stay for a "reason": for a mission. Recently in meeting some Lebanese Christians, I saw that they pose themselves the question of mission. The Church of Korea, a country with nearly two centuries of Christianity, sends 700 missionaries out into the world. This is highly significant for us Middle Eastern Churches with thousands of years of tradition. The Korean missionaries - including Protestants - are commonplace in Iraq, Egypt, and in other realities of the Middle East. Missionary awareness must be reassessed in the churches of the Middle East. It should be clear that we must remain in this region on a mission of love: to help the local people discover the gospel of Jesus Christ, who is the most amazing thing to save the life of a human being, freeing people from every weight. This is not a question of proselytism, but a matter of justice; even Muslims are entitled to know the Gospel, as Christians have a right to know the Koran. The Synod must spell this out clearly: do not be afraid, stay in the Middle East, but remain to proclaim the beauty of the gospel. Days ago I was flying back to Beirut. The man sitting next to me wanted to talk to me at all costs, and so we talked for over two hours. He is a Sunni Muslim doctor from northern Lebanon and he wanted to know the meaning of the Christian Trinity. I explained that the meaning of the Trinity is that God is love. The message of the gospel is that God is not only the Almighty, the tremendous God who demands retribution, who crushes evil. God is love and sharing. And since we are created in His image, we also live in love and mercy. And my interlocutor told me that it would be nice if Christians spoke about this more clearly, because it would be to the benefit of the faithful of all religions. The Synod will be effective to the extent that we implement it. A text - such as the one that will come out from the Synod – does not a revolution make. Rather it suggests to the Christians of this region that they must remain because they have a message to share. Maybe some believe they have no choice but to leave. But even in the West, this Christian will have the same mission. This mission gives true meaning to life. Their testimony is important. Caritas, Aid to the Church in Need, and others, come without being presumptuous and support the Church, but not exclusively. The Caritas in Lebanon or Egypt or Jordan, help Christians and Muslims equally. Several Muslims have entered the executive board of these associations. The Knights of Malta in Lebanon, open clinics in Shia, Sunni, Maronite villages, Catholic nuns are loved by Christians and Muslims because they welcome everyone with love. Catholic universities have a good percentage of Muslims students, often supported by grants offered by Catholics. The Church bears witness that it does not belong to a sect, but to a worldwide community that seeks not power but service. Even the Vatican, which is often seen as a power, it is actually an ethical, political, charitable service for the churches and the world. I must say that in the Muslim world, there is not a similar openness: instead there is increasing closure, increasingly strong proselytism. The Church is an institution at the service of man. In conclusion, the Synod's message to Christians is: we want to remain in the region to create together with Muslims, with anyone, a society for man. We are not a foreign body, but we belong to this land and we have something specific to offer, to build a more peaceful and more humane society. To those among Catholics, including bishops, who say: These are beautiful words, but then what? ... I answer, the words will bear fruit if we make them flourish. We are the actors that can make the words of the Synod a reality.